Join the Branford Land Trust for its third 2015 Winter/Spring Lecture as entomologist Kirby Stafford III presents FIGHT THE BITE: TICKS AND LYME DISEASE, on Tuesday, March 24, 7:00 p.m. at the Blackstone Memorial Library. 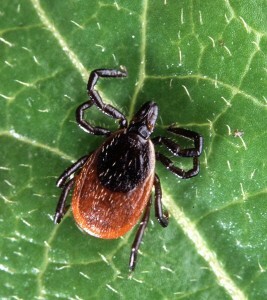 Did you know that tick-associated diseases are increasing? The Center for Disease Control estimates there are 300,000 cases of Lyme disease in the U.S. each year. In Connecticut, we have around 3,000 cases of Lyme disease reported annually and blacklegged ticks (deer ticks) carry four other pathogens that cause human disease. Dr. Kirby Stafford, Chief Entomologist of the Department of Entomology at the Connecticut Agricultural Experiment Station and the State Entomologist, will review the epidemiology of Lyme disease, other tick-borne diseases, and basic tick biology. He’ll also discuss his research on various practical and experimental methods of tick management. All Branford Land Trust lectures are free and open to the public. The final 2015 lecture will be “Sea-level Rise: Implications for Our Coastal Wetlands” with Shimon Anisfeld on April 22. For more information, please visit our website, www.branfordlandtrust.org.